It’s all Kay’s fault. My Alabama sister made this up (I think) and then had the nerve to encourage me to try it. There’s no recipe–just directions. Ready? Buy a package of Oreo cookies. I spotted these fun blue ones at Walmart but I think they have a limited showing this summer. Hope the blue doesn’t weird you out. They taste the same as the white ones. Buy a pint of Starbucks coffee ice cream. I like ALL coffee ice cream but have you tasted the Starbucks brand? Oh, my goodness. Something special indeed. 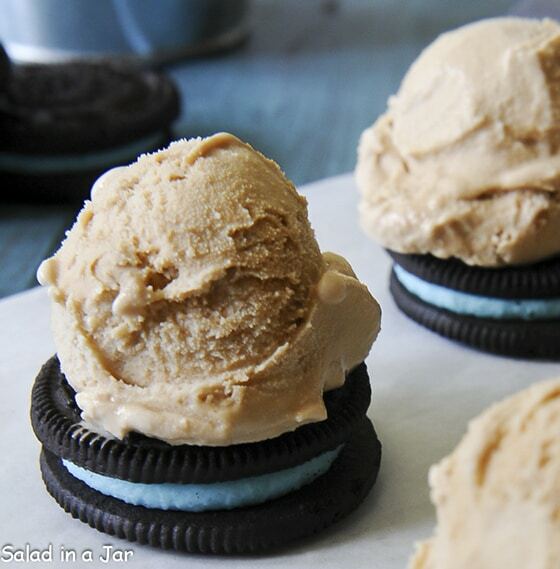 Spoon a small amount of coffee ice cream onto the top of an Oreo cookie. Eat immediately. Incidentally, these are 84 calories a piece as pictured but the number will vary according to the size of your ice cream portion. The picture appears larger than it really is. You have my permission, like you needed it, to eat this one standing over the sink. It can get messy unless you eat it in one bite. I suppose you could use a plate. p.s. With the temperatures warm enough to incubate yogurt on my back porch, there’s not much cooking going on around here. It’s even too hot to grill. This is about the only “recipe” I’ve made this week so I’m sharing the pleasure. Starbucks’ coffee ice cream is strangely delicious, and I’m not even a fan of their coffee generally. Same here Maria, I almost never drink Starbucks coffee and it took awhile for my sister to convince me I should try the ice cream. But she was right–in my humble opinion. How fun. My boys would get a kick out of this-maybe with a different ice cream. Put another Oreo on top for one heck of a ice cream sammie! The best part is that food eaten over the kitchen sink has no calories, right? This looks really tasty. I’m going to have to exercise a lot of self control to only eat one when I make them for my family. Pete, You’re not the first one to say that. The ice cream is really rich so that helps. I agree, I dont even want to boil water in the house, it’s so hot. But these are some pretty cool treats! I’ll have to try that SB coffee ice cream. Now, there is a recipe I have all the ingredients in stock!!! Y’know, one of the best things about Starbucks ice cream sitting in your freezer is that it is so rich and full of flavor that a small spoonful really is satisfying, unlike the no sugar added coffee ice cream I like from Braums. I swear they put some secret ingredient in their Chunky Cappucino Chocolate flavor that makes you want to eat the whole thing! Oh my goodness, I am so tickled you posted a no-bake recipe that doesn’t involve much activity of any sort. 🙂 I have not tried Starbucks ice cream, but on your recommendation, I will! Now I ask you, who wouldn’t want to follow these directions! I feel like I can taste these when I look at the picture!!! You are evil, posting something like this! What an easy and fun dessert – love the presentation and I know the little ones would think this was so fun too! YUM! Cookies and Cream Blizzards are a favorite, and this is jazzed up a notch with the coffee ice cream. I need to go to the store. NOW. This is just the kind of recipe I love! 🙂 I totally understand the “too hot to cook” thing. It has only just now gotten bearable enough for me to think about it. Isn’t Starbuck’s ice cream wonderful? These little bites have got to be wonderful, considering they’re made with two of my favorites!